Donald Trump entered the White House, in part, on a wave of voter dissatisfaction with the foreign policy the United States has pursued for the past quarter century. More than any other recent candidate, Trump succeeded by linking domestic problems, such as unemployment and crime, to issues of foreign policy, such as border control, international trade, and Islamic extremism. Trump himself may not be the answer to the threats the country faces, but his election offers an opportunity to reconsider the state of our relations with the world, to more forthrightly admit what has failed, and to consider bolder changes in our approach to foreign policy than would take place after a more “normal” election. Conservatives must recognize the widespread public dissatisfaction, and respond with a realistic approach to the challenges we face abroad and at home. Failing to do this will result not merely in a more dangerous world, but also in a yet more disillusioned U.S. public that will demand a retreat that endangers our vital interests and puts the ability of Americans to live freely at risk. It is time for a conservatism that neither shrinks from defending our interests, nor rashly presumes American omnipotence. A new foreign policy can be built by recovering a traditional realist approach that held for much of the Cold War era and which was shared by both parties. Doing so will reclaim American realism from those on the right who have made it the handmaiden of neo-isolationism, while ensuring that it avoids the overreach that since 2003 has undermined support for America’s role abroad. The end of the Cold War marked the beginning of the age of illusion for American foreign policy. Entranced by our victory and our power, we have swung wildly since 1991 from ill-planned interventions to unwise appeasements. The error common to all our mistakes was a refusal to accept a balance between the necessity of and the limits on the U.S. role in the world. Madeleine Albright’s “hyperpower” had little need to practice the policy of the golden mean. Having vanquished both Nazism and Communism in the space of a lifetime, American policymakers were all too eager to accept Francis Fukuyama’s declaration that history was over, even if they interpreted in different ways the license this gave them to remake the world. From Bill Clinton’s “democratic enlargement,” through George W. Bush’s freedom agenda, to Barack Obama’s retreats, we have been too willing to believe that the era of great power politics is over. Our optimism encouraged our interventions and excused our retreats. But geopolitical competition has not disappeared. Nor have our adversaries. The world is now less stable—and above all, less safe for American interests—than it was in 1991. And disorder is rising in Europe, in the Middle East, and in Asia. Today, nearly a generation after the collapse of Soviet Communism and over fifteen years after the 9/11 attacks, it is undeniable that Europe is at greater risk, the Gulf is more war-torn, and the Pacific less secure than they were eight or eighteen years ago. We must arrest these trends, which threaten the central purpose of American foreign policy. The fact that they also threaten the “liberal international order” that many claim has characterized part of the world in the postwar era is merely an incidental fact, for it is our efforts to defend our interests that played the central role in defining that order. Today, focusing on the order, not U.S. interests, merely perpetuates a central fallacy of post–Cold War foreign policy: it emphasizes the waterwheel, not the water that makes it move. We are committed to a leading, though not dominating, American position in the world. But we also believe the United States has dangerously neglected to respect the limits on its vital role in the world. To recognize a world increasingly in disorder is obviously not to assert that all disorder threatens, or has the potential to threaten, American interests. Just as importantly, we recognize that we cannot live by postmortem. An obsessive focus on the past—above all, on the Iraq war—risks paralyzing us today. Much like the post–Vietnam War era, foreign policy is refracted through the prism of Iraq and Afghanistan, and those on both sides who fought the bureaucratic battles of fifteen years ago continue to be shaped by the experience. It is time to move on, however, even as part of the challenge ahead remains responding to the threats the wars were designed to eliminate. Constructive conservative ideas will come from leaders, and a generation, less personally fixated on 2003, or on the post-1989 world, for that matter. If we are to understand what we must do in the world, we must return to the realism of the American political tradition, in which, as Washington put it, our interests are guided by justice. To recover that tradition, we should think again about the purpose of American foreign policy. Yes, it is to preserve the sovereign and independent American union. Yes, it is to protect our homeland. And yes, it is to keep us prosperous and at peace. But these are not ends in themselves. They exist to allow Americans, with due regard for the just laws of others when abroad, to be free—free to preach, to trade, to study, to help, to work, whether overseas or at home. That is how we conserve free America: by acting to make sure that individual Americans are free to live their own lives. The true purpose of U.S. foreign policy is to protect and promote the freedom of individual Americans, who by their own actions are remaking our world. We will enjoy that individual freedom more fully the more nations embrace the principles of democratic sovereignty on which our own union was founded. A world of unfree nations, a world divided into spheres of influence controlled by the hostile or the unfree, would be a world in which the freedom of Americans would be curtailed or, at worst, would exist only on the sufferance of others. But freedom for the world begins with freedom for America. The first, irreducible American interest is the preservation of the sovereignty of the United States and the political order of republican government under the Constitution. If we lose those, our other interests will be irrelevant, because we will not have the command of our own fortunes. No regime or idea that seeks to traduce the sovereignty of democratic nations is our friend, because our purposes cannot be realized in a world defined by the unfree. And we should remember one more thing: states that reject democratic sovereignty are implicitly rejecting our legitimacy. Indeed, our challengers today—just as in 1776, or 1917, or 1941, or 1950—are enemies of the sovereign democracies. In this most fundamental respect, nothing has changed: from the American Revolution to today, our challengers have always been imperialists, eager to claim the right to rule without the democratic consent of the governed. We have faced empires of power, of race, of class, and of religion—but empire, and the imperial struggle for power, is the constant. The problem is not that there are other great powers in the world with interests of their own. It is inevitable that great powers will not accept neighbors who threaten them; what is not acceptable is for great powers to interpret a desire for independence and good relations with other nations as inherently threatening. To do this is to claim the right to an imperial sphere that is based on a rejection of national sovereignty. The United States rejected one such claim in 1776. It has rejected many other, similar claims in the succeeding centuries. The sovereign democratic republic is not merely the freest form of government ever devised. It also defines the international system into which the United States was born, and on which its system of government is based. But today, supranationalists contemn the nation-state and muse, in the words of the president of the European Commission, that “borders were the worst invention ever.” Others are more malignant: Russia seeks to change borders, or render them meaningless, in order to suborn and dominate its neighbors; China seeks to impose an acceptance of its national interests on its neighbors; and Iran is making its dream of regional dominance into a reality—with the aid of Russia and the U.S.-brokered Joint Comprehensive Plan of Action. Worst of all, ISIS and al-Qaeda wish to eradicate the sovereign state and replace it with a religious empire. We need not be afraid of our competitors—or, indeed, of our enemies. However, we do need to acknowledge that that is what they are, to take them seriously, and to admit that they want a world organized in ways that are fundamentally antithetical to our principles. At times, it may be possible to find common interests with some of them. But we should entertain no illusions. An example from the past makes the point: We were not wrong to cooperate with Stalin to defeat Hitler. But we were wrong to delude ourselves by calling him Uncle Joe. As Americans, we should know what it is to live in a tough, competitive world, because it was the world our nation was born into. That world endures, and no amount of post–Cold War fantasizing will make it disappear. From the start, we made our way in that world thanks to our alliances—for it was a military alliance with France that helped us win our independence. Provided that we retain the power to decide if we will fight—and we do—our alliances today raise no questions of principle. 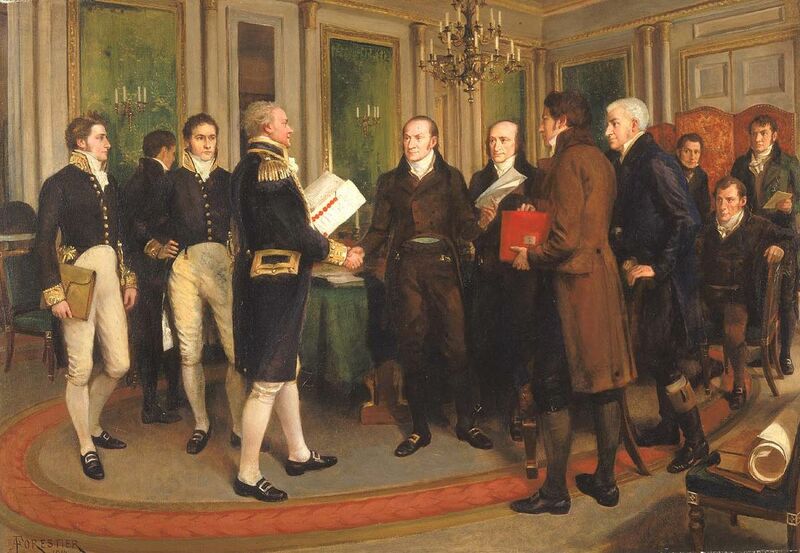 After all, we claimed the right to contract alliances in the Declaration of Independence itself. Nor are our alliances an act of charity. First and foremost, they have mostly been made with strategically important countries, traditionally those that have been able to help uphold order in their regions. Today, there is little disagreement in America that our allies should pay more, so as to do more. Every president since Eisenhower has asked for that, and with rare exceptions—such as Britain under Margaret Thatcher—they have asked in vain. We cannot sustain our alliances unless the American people believe that every member nation is making a fair contribution. But the problem is not that our allies are free riding on us, for when we cut our defenses, they do not increase theirs. It is that the history, culture, and politics of our allies now make them unwilling to accept that military strength is vital to diplomacy and deterrence alike. They have profound incentives to minimize, dismiss, and ignore threats—and hence not to spend enough on defense. For our European allies and Japan, the demands of the social welfare state, mixed with an understandably lingering horror at the memories of war, have combined over decades to make unpalatable most discussion of hard power and the need for martial readiness. The fear that returning to the world of machtpolitik will put at risk all they have built since 1945 is understandable, if unsuited to the current geopolitical environment. Yet we should still appreciate what we have in our allies. Tens of thousands of brave Americans gave their lives to create the alliances we have today. The costs we pay now are maintenance expenses on the peace they won. Of course, our allies benefit from this. But precisely because we are on top, we benefit most from the world as it is today, even if our complacency sometimes allows others to take advantage of the stability we created for their own malignant purposes. Our democratic allies, who wish—a little too hard—only to live in peace, feel the same way about the status quo. That does not mean we need to excuse the failings of our allies, indulge their supranational fantasies, outsource the defense of our interests to them, or allow them to completely outsource theirs to us. Instead, we need to have just as much realism about our allies as we have about our enemies. That means recognizing that what our allies lack is the luck that we in the United States enjoy. We are fortunate to have Canada and Mexico as neighbors; our allies, unfortunately, are next door to China, Russia, autocrats, and Islamists. Given our good fortune, and our strength, it is inevitable that we are the ones who are forward deployed, because we are the ones who have the geopolitical freedom to help. But we should remember that our deployments defend our place in the world—and the ability of Americans to be free in it—just as much as they defend our allies. Without our close alliances and the forward yet benign deployment of our forces, we would look out onto an unwelcoming Middle East and an increasingly troubled Asia, where Americans would be seen simply as outsiders, not as welcome partners by some. Moreover, the allies we have, such as the United Kingdom, Israel, Japan, and South Korea, are part of a global network of liberal societies and economies that dynamically interact and add immeasurably to global wealth, not least back in the United States. We cannot avoid becoming involved merely by retreating from our allies. American indifference or perceived weakness can engender instability that is not in our interests, and which forces us to consider more risky forms of involvement. For example, China’s buildup of forces in the South China Sea, and its efforts to dominate strategic waterways and raise doubts about future freedom of navigation, occurred in part due to its perception that America’s lack of active military alliances in Southeast Asia would make the United States unable to counter its expansion. To China, America is an interloper in areas it has traditionally dominated and considered part of its sphere of influence; thus, it believed that U.S. naval and air forces (which currently can only be transiently present in Southeast Asia), were a paper tiger and could be intimidated into eventual withdrawal. Washington, indeed, has struggled with trying to prove its credibility in keeping open vital sea lanes in the South China Sea, without having bases from which it can project a regular presence. That is why offshore balancing is an attractive concept in theory; in the real world, it would be all offshore and no balancing, as our allies and others would doubt our commitment to play a meaningful role during a crisis, and as the costs of “fighting our way back in” would be politically unacceptable at home. Our alliances also help us in another way. Without us, our smaller yet strategic allies would be unable to defend themselves, and our larger ones—Japan, Germany, Saudi Arabia, and South Korea, to name four—would have to fend for themselves. The cheapest way to do that would be to acquire nuclear weapons, which could lead to a cascade of nuclear proliferation. The resulting regional environments would be tense and unstable, and future crises could well become violent. We therefore need to reassure our friends as we deter our enemies—for the sake of greater stability that reduces the chances of a major conflagration in strategic areas drawing in American forces. Happily, our alliances, backed by our strength, are a means for us to do both at once. Part of the answer to the problems we face with our allies is for the free world to stop doing the things that alienate its publics and make it vulnerable to autocratic blandishments. Above all, we must stop centralizing power in the hands of unaccountable experts, an approach that, as the EU is belatedly discovering, only makes rejecting democracy more appealing. Another part of the answer is for the United States to make clear what side it is on. Starry-eyed “resets” or “open hands” towards aggressive, repressive regimes only confuse those who wish to rally beneath a flag of freedom and liberalism. Trying to win over the whole world risks losing those already on our side. Finally, our first choice should always be to deter trouble where it matters most, not to fight it: the example of Western Europe after 1945 is proof of the value of resolutely holding the line. Thus, the danger in this competitive world is not that we will be too strong. It is our weakness, not our strength, that is provocative, because American weakness makes our allies fearful and encourages our competitors to take chances. Providing strong defenses is both necessary for peace and a charge laid upon Congress by the Constitution. This charge must be fulfilled. Yet America’s geostrategic position means that we will usually act far from our shores, not least when we employ military power. Being primarily an expeditionary nation is not a limitation: it is a strength that allows us the flexibility to intervene in ways that respect the limits on our power. Going forward, we must emphasize our expeditionary nature, while remaining willing to base U.S. forces in strategic areas for reassurance and insurance purposes. This means, above all, that we must invest in precision airpower to inflict substantial damage, a strong navy to project power while maintaining freedom of the seas, credible land combat power to deter adversaries who threaten our allies, and homeland defense—including the most advanced missile defenses and cyber defenses. We face many perils, but in many cases, if we act rightly, time is on our side. The only thing that could truly hurt the United States in a way that would change us instantaneously and forever is a WMD attack. We must prevent such a catastrophe by any means necessary. But in defending ourselves, we must not be led into rash actions. President Trump is correct that our goal of peace is best achieved by a “disciplined, deliberate, and consistent foreign policy” backed by a strong America that understands that “caution and restraint are really truly signs of strength.” The restraint that President Trump and many of his liberal opponents praise means that the era of indiscriminate interventions, especially in pursuit of humanitarian objectives or to teach foreigners to elect good men, is over. This means privileging the interests of the American nation—and its people—over the larger, though fictive, international community. The lessons of World War II and the Cold War were too easily transmuted into the argument that our security policies must always be undergirded by morality. Today, we place more emphasis on the unquestioned evil of both Nazism and Communism than on the existential threat their power posed to Western civilization. It follows that for defenders of the supposed “liberal international order,” U.S. involvement in humanitarian crises or efforts at nation-building in inhospitable climates becomes the true measure of the legitimacy and wisdom of our foreign policy. When liberal states reveal their hypocrisy by not intervening in such crises, this delegitimizes them, and thereby makes it harder to advance arguments based on real national interests. The greatest risk of all is that, when do-gooding dominates policy, the American people are more likely to withdraw their support for defending our overseas interests. The path to a sustainable and strong U.S. role in the world does not rest in valorizing the “rules-based international order”: it rests in understanding the value and the limits of our power. Believe what you will about Iraq or Syria. The fact is that there is no public support for such interventions today. It would be an act of folly to press for actions that, for lack of that support, cannot be followed through to victory. It must be an ironclad rule for the United States that we do not start a fight we do not intend to finish. But this does not mean we give up the competitive struggle. Instead, we must find new ways to wage it. While we should not use our national strength to uphold a fictive international community, we should recognize that our interests rest in advancing towards a freer world. Thus, our goal has not changed: it is to help defend, and, where possible, to advance prudently towards a world built on sovereign democracies in which Americans can be safe and free. And the American constitutional order—if we keep faith with it—has great long-run strengths, which we can use in this struggle; it imposes limits on centralized power and the competition it encourages. Principle and prudence alike tell us that we must play the long game. Our method should not be imposed regime change, except in cases of vital national need: it should be the creation of leverage, the use of pressure, and the imposition of costs to constrain our opponents. It is a great mistake to believe that we must always meet our adversaries head on: for example, the U.S. development of hydraulic fracturing, which reduces world oil prices and thus damages the Russian economy, imposes costs on Russia and decreases its strategic influence. Our goal should be to seek out and use such indirect methods to encourage the buildup of opposing forces within other systems, and—as Ronald Reagan did—to build opportunities for negotiations to be conducted on our terms, not theirs. And at times, in part with the aid of this strategy, change may come in another way, preferably through peaceful transitions that reflect a change in culture, and not just a struggle for power. Such a failure to change the culture is why there was no revolution after the collapse of the Soviet Union, but rather the more efficient reorganization of power by a repressive clique. Yet autocracies are brittle: eventually they crack, especially when the people living under them seek to emulate more successful democracies. That is the great fear of the Chinese Communist Party and the reason why it is repressing civil society today. We can win this struggle not primarily through force of arms, but through persistence and flexibility, backed by strength and the preservation of our national power. The greatest strategic challenge we face today is not the strength of our main adversaries: it is the weakness of their neighbors, be they the smaller and still-developing nations of Southeast Asia vis-à-vis China, or the economically challenged and militarily weak nations of Europe facing Russia. By various means—hybrid war, political subversion, or fear induced by threats—these nations, some of them our allies, are being suborned in ways that we find hard to combat and are reluctant even to acknowledge. A world divided up into spheres of influence, largely controlled by our adversaries, would be neither stable nor free. While we cannot prevent powerful nations from having spheres of particular interest, it is not in our interest to allow them to exercise neo-imperial control over their neighbors. We are by instinct and by interest opposed to empires. If illiberal states dominate vital regions, such as East Asia or Central Europe, the result will not be good for the freedom of Americans in the world, or the idea of republican self-government, or for our relative power. It would thus be profoundly antithetical to the true purpose of our foreign policy. So we must also draw the line in two crucial areas. First, no great power has the right to seize disputed territory by force of arms or stealthy annexation: the United States, together with as many allies as it can muster, must deter such seizures if possible, and, if necessary, use all means, including its military, to restore the status quo by imposing costs on an occupying power. Second, the United States must support sovereign nations that are resisting attempted subjugation by outside pressure, if that pressure is exerted by a nation that has the strength to alter the global balance of power. This means that we must oppose actions such as Russia’s assaults in Ukraine and the Caucasus, and China’s expansionism in the South China Sea. We cannot rule out the use of military force in cases such as this: if we do, other powers will simply escalate in any crisis until we quit. But there are many ways to use our military, including to deter, among other things. The crises in Ukraine and the South China Sea reflect a U.S. and allied failure to establish credible deterrence. Our military can also be a cost-imposing instrument: even if we never fire a shot, we can use it to force the other side to respond in ways that impose disproportionate costs on it. But the most important fact for us to recognize is that crises of this sort never stand alone; they are always part of a larger strategic competition. This means that we cannot limit ourselves to symmetric responses. Or, to put it more concretely, just because Russia attacks Ukraine does not mean that our response should be limited to Ukraine. To limit ourselves to a single theater of our opponent’s choosing gives them the initiative, denies the larger competition, and reduces our ability to make full use of all the means—military, economic, and diplomatic—at our disposal. And since the United States has a wider range of possible responses than any other power in the world, we only hurt ourselves if we artificially narrow the field of competition to a single disputed region. In other words, it is an error to believe that our goal is simply, and narrowly, to restore the status quo ante in particular, in disputed areas of the world. Our goal is much broader: it is to win. Or, more subtly, it is to engage in competition in ways that improve our position and damage those of our competitors. It is therefore not right to criticize responses—such as the sanctions that the United States imposed on Russia after its invasion of Ukraine—by arguing that they did not resolve the crisis, for the point of such responses is not to resolve the crisis: it is to open another front in the wider competition, and to do so in ways that impose long-term costs on our opponent. In time, the weakness of their system, and the stresses created by our responses, will create opportunities to resolve particular crises—but it is foolish to expect quick results, or to draw up elaborate plans for how we will win. After all, it took fifty years for the United States to redeem the Baltic nations from the Soviet Union, and no one could have foreseen the outcome of the Cold War in 1939. That is not to argue that all U.S. crisis responses are beyond criticism, or that they will inevitably be successful in the long run. But it is to argue that we are usually at fault, not simply in our response, but in failing to recognize and engage in the wider competition. In other words, the problem with U.S. sanctions on Russia is not that they have not produced immediate results: it is that sanctions are a way of isolating the crisis into a single theatre and, at the same time, disguising the wider competition—above all, from ourselves. The danger of these crises is not that they pose a direct threat to the United States. It is that, if driven by great powers, they are central to the competitive world of geopolitics, and can even come to define an era. Not all crises are our business, but we cannot allow powerful nations to believe that they can redivide the world without reference to the values and interests of the United States. The danger rests not so much in any particular crisis, but in the rise of the belief among the powerful that the world is there for taking. As Winston Churchill put it in 1935, in response to the Italian invasion of Abyssinia, “It’s not the thing we object to . . . it’s the kind of thing.” Because the powerful and ill-intentioned learn from each other, we are perilously close today to a world in which this “kind of thing” becomes the way things are done. While geopolitics has returned to the world, it has not returned to the way we think about it. Instead, if there is a shared concern over the current state of the world, and America’s role in it, which links both liberals and conservatives, it is for the future of what is often called the “rules-based liberal international order.” This post–World War II system is supposed to have been largely created, financed, and defended by the United States, and to have defined norms, set rules, and created institutions in the international realm, above all for the democratic states. Any list of what its defenders believe comprises the liberal international order risks being judged incomplete, but its norms include the acceptance of national sovereignty, the enshrinement of and respect for international law, and abjuring the use of force except in self-defense. The rules include observing safe maritime practices to ensure freedom of the high seas and refraining from unfair trading practices. The order’s attendant institutions developed steadily after 1944, and included the elements of the Bretton Woods system such as the International Monetary Fund, as well as institutions as diverse as the United Nations, NATO, and the World Trade Organization. This order was derived from American and European concepts of law and liberty, yet was flouted to different degrees, at different times, and for different reasons even by those states most vocally supportive of the concepts underlying it. The goal of this system—a laudable and, in light of World War II, a necessary one—was to bring the liberal and economically vital parts of the world together into an open and stable system of trade and political freedom. The immediate concern was to restore Western Europe and prevent the rise of a new totalitarian menace. After the hardening of the Cold War with the 1948 Berlin Crisis and the 1949 victory of the Chinese Communist Party, the liberal system was also seen as a means for containing global Communism. With the demise of Soviet Communism in 1989, the incorporation of previously alienated parts of the world into this liberal Western structure, and the explosion of global trade, the superiority of the “liberal international order” appeared to be self-evident. As evidenced by today’s panic at the supposed collapse of this order, America’s national interests came to be seen as identical to, or even determined by, the maintenance of the order. Even the global challenge of radical Islamism and of a revanchist Russia and revisionist China has not raised doubts among defenders of the liberal order as to its existence, or its utility as a guide for policy. Just as difficult for many to accept is that institutions created for one purpose may need to be revamped when the original motivating need is no longer present. It thus becomes easy to claim that the global order that sufficed after 1945, even if ossified, must be upheld today by any means necessary. Yet in reality, there never was a “liberal international order.” Rather, there was greater stability in the post–World War II period, even during the Cold War, in the parts of the world that mattered most to us. In other words, what was seen as an “order” was simply the relative decline of disorder in the areas of the world led by the United States. The post–World War II decades were obviously not peaceful, especially in places like strife-torn Africa or coup-ridden Latin America. But proxy wars, civil wars, military interventions, covert actions, and terrorism never reached all-consuming levels in the West, as had happened during the late 1930s and the Second World War. Thus, what is often described as the “order” is instead a pattern of behavior, ranging from mostly reliable support for the system by some leading liberal states, to considerably lesser fidelity by many others that exist on its margins, to outright rejection by a few. (The regimes that flatly rejected the order were often described by U.S. policymakers as “pariah” states—often for good reasons, such as the oppression of their own people or acts of aggression abroad.) Even states most disposed towards the ideas of the order often fell short of their professed beliefs, acting instead on the basis of cold calculation. Whereas idealists never wanted to fully acknowledge the persistence of national interest and realpolitik, realists often failed to appreciate that blatantly ignoring international institutions makes it easier for less powerful nations to consider liberal leaders hypocrites, thus undercutting support for often needed policies. Despite such shortcomings, the several constants in the post-1945 “order” were the largely judicious employment of American and Western power, the U.S. defense of allies and partners, and the steady spread of trade, buttressed by a network of political mechanisms that privileged diplomacy over machtpolitik. A prudent realism that emphasized the importance, but also the limits, of U.S. power was the defining feature of post–World War II U.S. national security policy, and was broadly shared by Democrats and Republicans alike. This was a uniquely American realism, one premised on the recognition that the United States must conduct its foreign policy on the premises of power in the wise service of freedom. The intention of U.S. policy, rightly, was to protect American interests, but over time, and especially after the end of the Cold War, this realism faded away, as the seriousness enforced upon us by the Soviet Union disappeared. After 1989, the liberal order was reified, and came to be seen uncritically as an undifferentiated good to be defended for its own sake. This was despite the reality that in practice—as in Rwanda in 1994 and Syria in 2014, and many other moments—the United States and its allies were incapable of living up to this ideal. Much ink was spilled in defense of the order, but fewer attempts were made to assess how well the fictive order was advancing the safety and prosperity of America, U.S. allies, and other liberal or liberalizing states. Above all, believers in the order emphasized the need to “engage” with our adversaries in order to bring them into it, as though merely being included in the club would make autocratic regimes fit for membership in it. What is happening today is not the death of the “liberal international order.” It is, first, the intrusion of geopolitics into parts of the world that appeared to be safely isolated from machtpolitik, such as the South China Sea and Ukraine, and, second, a reaction in the West against the failures of Western post-1989 policy, including its foreign policy—a policy that is now as out of date as the institutions of the late 1940s were in the early 1970s. Since the end of the Cold War, we have added freer trade in people to the freer trade in goods we promoted after 1945. Too many nations—particularly in Europe—have emphasized sustaining welfare systems and saving the euro over economic growth. And above all, we have indulged an excessive optimism about the value of “engagement” and neglected the realistic, yet liberal, path that we followed after 1945. In the circumstances, it is no surprise that candidates who criticize or reject this path have found success. The stability that the liberal nations, led by the United States, have provided in parts of the world—and the freedom on which it is based—is rightly valued by many commentators. But they should remember that this stability did not grow, and does not exist, independent of American power. The relentless, uncritical praise for the “rules-based international order” that dominates today’s policy debates is dangerous because it confuses the end of the strategy with its means. The goal of maintaining democratic sovereignty in crucial areas of the world so that Americans can trade, live, and visit, is the true end of U.S. foreign policy, and the creation of patterns of behavior that both rely on and advance democratic sovereignty has been our means to achieve that goal. The “order” itself, and the particular institutions that comprise it, have no value beyond their contribution to these means and end. Indeed, hazy, moralistic talk about the order almost invariably takes U.S. strength for granted and U.S. interests as read. Instead, we need to understand and defend our interests as they actually exist. If we do that, we will renew—and advance—what actually matters about the “order” with means and in ways that can command popular support today, and which make use of that peculiar mix of idealism and realism that is unique to our system. After all, the means we use to advance our interests have been refashioned before; in the 1970s, when the Bretton Woods system collapsed, Nixon brought China into the international system, and international institutions such as the World Bank were transformed (though not always for the better). The 1970s and early 1980s were an era of transition, just as the mid-2010s are today. That is because, since 1989, we have been riding on Reagan’s coattails, and living in the world that he made. But we are now as far away from the end of the Cold War as the early 1970s were from the end of the Second World War. It should not surprise us that the means on which we are trying to rely are, again, under strain. If the United States prudently leads, the stability and freedom we have built will survive—indeed, it will be renewed and extended. The real danger will come if we overreact or if we refuse to lead, if we indulge in mindless praise of the rules-based international order, or if we become so transfixed by the rise of authoritarianism that we try to find safety by clinging to every facet of the “order” as it exists today. If we soberly assess the shortcomings of our post–Cold War policy, we can advance the freedom of Americans today as we have done in the past: by working, with restraint and persistence, towards a world made up of states based on our principles. Our case today is not new. We are in a world that we never left—a competitive world, but also a world with allies and friends we have now, and some we will have tomorrow. Our minds have been clouded by our failure to recognize our need to compete, by our refusal to praise and play to the strengths of our constitutional order, and by an excessive optimism that reflects both the best and the worst of our national character. We must disenthrall ourselves. If we can do so, we shall save our country—and, as Americans have before—the world. 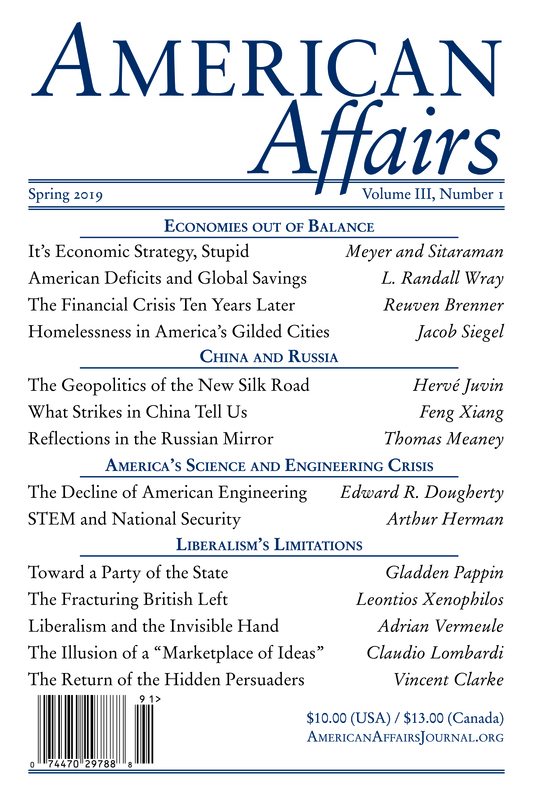 This article originally appeared in American Affairs Volume I, Number 2 (Summer 2017): 184–98. Ted R. Bromund is a senior research fellow in Anglo-American relations at the Heritage Foundation. Colin Dueck is a professor in the Schar School of Policy and Government at George Mason University and a non-resident fellow at the Foreign Policy Research Institute.